As we have seen on the last page the “missing soot” argument is worthless, not only because there is soot everywhere. But there is more evidence that some ancient cultures – and maybe even the Egyptians - knew and used electricity. 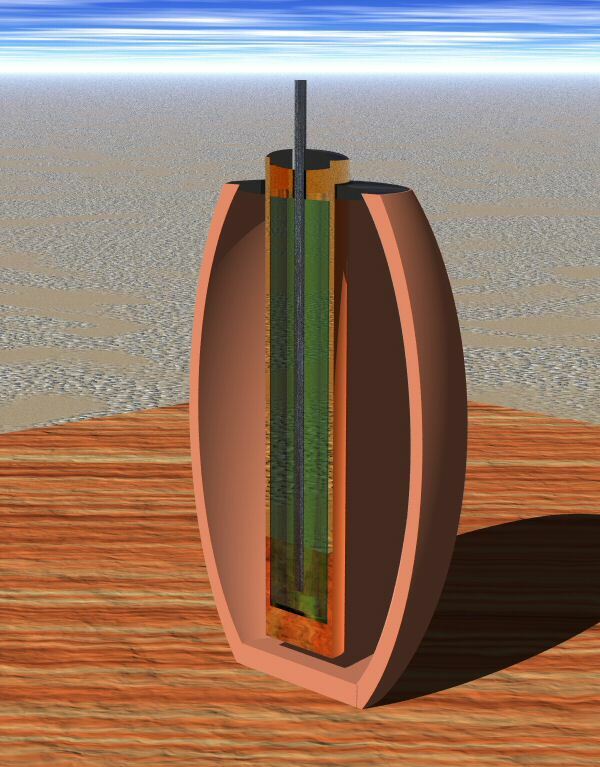 Inside the vase was a copper cylinder which was closed at the bottom with a soldered sheet of copper. On the top it was closed with a plug made from asphalt, and through the middle of the plug an iron rod run through into the cylinder. The rod was degraded so it was thought that the cylinder was filled with a corrosive fluid. Right from the beginning the chief excavator Wilhelm Koenig had the opinion that these pots had been batteries used for galvanizing items. Some findings and writings led to the belief that the Parthians knew a method of coating copper or silver with gold by using gold cyanide - without the use of electricity. With a reconstruction of the supposed battery the galvanizing rate could be quadrupled. Later more pots of a similar kind were found in that region. And since we know that the Egyptians had trade contacts to the Mesopotamian region from the pre-dynastic time on, long before the pyramids, those batteries could have found their way into Egypt. That would support a part of the thesis. It would, if there was not the problem with the time horizon. This is often devastating for alternative ideas, and this one is not different. The Parths did exist in the small period between 250 BC to 225 AD, more than 2000 years after the pyramids were built. The founding of the parthic empire even took place 120 years after the end of pharaonic Egypt (Egyptologists set this end to the invasion of Egypt by Alexander the Great in 332 BC). So even IF the Parthians used those devices for the production of electricity, it would have no impact on the Egyptian civilization. In fact, the other similar devices found in the region date to even later times, to the Seleudic empire (from 300 AD on) to the late Middle Ages (around 1200 AD). 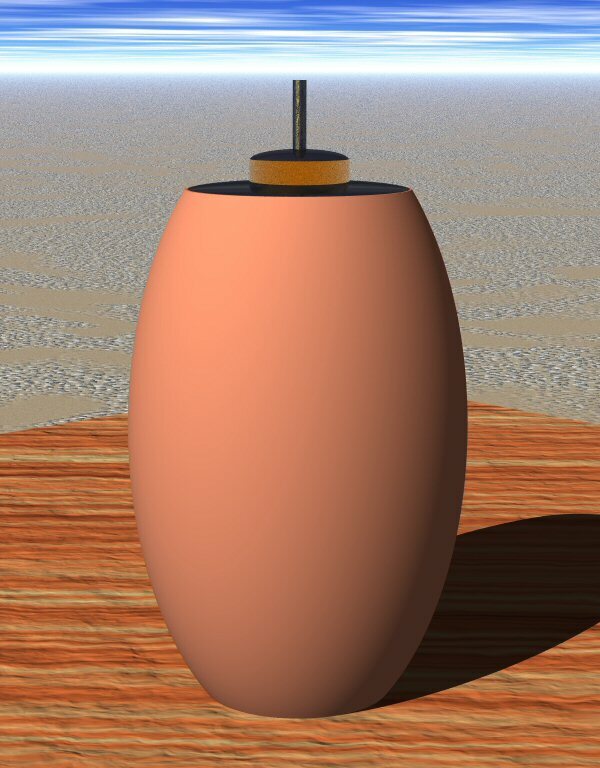 And the Baghdad battery itself is most probably from the time around the birth of Christ. There are surely differences between an accelerated galvanizing technique and lighting a light bulb. In the first case small amperages and voltages are enough to do the job, but not in the second case. Even a small torch bulb needs about one watt to shed a dim light. The performance of a battery is the product of voltage and amperage (V x A). The voltage is a material constant between different metals. If we place two different metals in acid we can measure an electric difference measured in Volts. This difference is independent from the size of the plates, it only depends on the materials used. The difference between two plates of the same material is null. We can arrange the elements to form an “electrochemical scale” with the most negative elements (giving up electrons) to the left and the most positive ones (collecting electrons) to the right. This principle is known to us for approximately 200 years, and the best combinations for metals are known almost as long. The discoverer of that principle was Allesandro Volta, who demonstrated in 1800 his first battery, the Volta column (see picture). It delivered 25 volts and a high current. The "batteries" found in Baghdad however are quite poor in comparison. Some contained only same metals (copper rods in copper cylinders) and can produce therefore with this primitive type of construction no voltage at all. And those few who could produce electricity used the metal pairing copper/iron. Those metals are only 0.74 volts apart on the electro-chemical scale (E0 Iron = -0,404 V, E0 Copper (Cu2++2e- = +0,337 V). Volta used even for his first experiments the metal pair silver and tin with a difference on the electrochemical scale of 1.6 volts. By combining many of these elements in a serial circuit he reached the 25 volts mentioned. Comparing Volta's results with the for many 100 years unchanged Baghdad-"batteries" lead to the conclusion that the phenomenon "electricity" was no subject of systematic research in antiquity. But a continuous research would have been essential for the development of any form of electric lighting. The second factor for a battery was solved nearly as inefficient than the first. The amperage depends on the surface of the used electrodes. 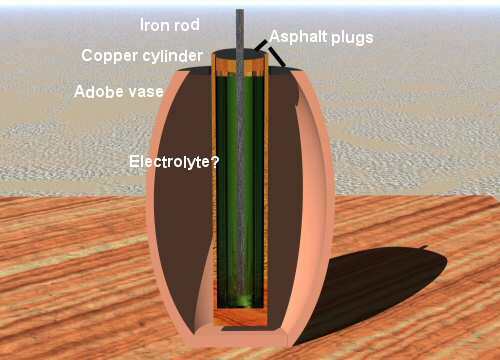 An ideal battery possesses two electrodes with surfaces as large as possible, with materials as far as possible apart on the electro-chemical scale. The plates on Volta's column had a much lager surface area than a small iron rod, and the electrochemical difference im more the double than the metals of the Baghdad-”batteries”. Our zinc coal batteries have as central electrode an activated charcoal rod with an active surface as large as several football fields. The “electrode” of the relics of Baghdad in form of a small, single iron rod is again a poor solution showing again that there was no systematic research of electricity. In 1995 I made a reconstruction of a Baghdad-type battery. The first test was a disaster. The chemical reaction that produced electricity stopped after a few minutes. After some research I found the reason: Such natural acids which could have been used (I used vinegar) need air to react. Therefore the closed original constructions never could have worked as batteries! After I drilled several holes into the cylinder it produced about 0.4-0.5 volts with open contacts, and had a short circuit amperage of 50 mA. The electrical "performance" adds up to 25 milli Watts without connected devices (which breaks down to 1/10th with 10 ohm resistor attached). That means, however, that for the operation of only one 1 watt-bulb the ridiculous quantity of forty batteries is needed! Since each battery weighs approximately 2 kilograms, the Egyptian flashlight ha would have a weight of about 80 kilograms - without rack and wiring! After approximately 8 hours power output the small central electrode decomposes into a green, poisonous mud which must be disposed of. And the soldering on the bottom gave way, too, so that the whole mess fell into the flower pot I had placed below the metal cylinder. One 1 Watt bulb needs 40 batteries per working day. => each system needed 292000 (!) batteries! ==> With a total weight of 233600 tons! All these batteries would have to lie around somewhere as scrap iron or waste. The find situation for batteries in Egypt is however ZERO! There is just another minot problem always "forgotten" by the proponents of ancient batteries: The iron. Iron came into use in Asia Minor only around 1600 BCE, and Egypt began to produce iron tools even later, around 700 BCE. Only very precious iron from meteorites was used earlier, for expensive jewelry and cult tools. Therefore the use of these batteries during pyramid construction in 2500 BCE is simply impossible. Even after the introduction of iron it was a precious metal, much more expensive than gold. But each "battery" needed a central iron rod as main electrode. So it's simply impossible that a metal first used in 1600 b.C. played a major role in lighting pyramids built more than 1000 years before! Each battery contained about 10 cm3 of iron, abot 79 grams, so for the whole 400 large tombs about 9100 tons of this metal was needed. From this amount of iron 48 million daggers like the rare example in Tut Ankh Amun's tomb could be fabricated. From these numbers it can easily be derived that the operation of electrical lamps with the so-called Baghdad batteries was simply impossible. But no other antique energy sources are known, so that any lamp faces the problem of a missing power source. Erich von Däniken tried in his special way to make a connection between the Baghdad batteries and electric lights. In his TV show "Aliens - do they return?" he tried to suggest that a gas-discharge lamp could be powered with such a battery. So he connected a digital multi meter to the battery - a loud buzzing noise suggests a high voltage. On the display of the multimeter we could see a not defined voltage of "0293" followed by the "reconstruction" of a Dendera-type gas discharge lamp also connected with a multimeter, and gives the impression that both voltages are of the same amount! If those pots are not batteris, what else could they be? To solve that I have to remind you, that the Baghdad pot is an exception. Some of the pots had a number of iron rods with no connection at all to the plug, others had the rods only on the inside of the plug without reaching through to it, so no electrical connection could have made. And even more pots had only copper on copper. All these pots could never have been batteries. A hint about their function could be the exact location where they have been found. All these pots were located in "founding pits" under the corners of buildings. This was a place where in many cultures blessing spells for the new found building were hidden. These were often written on papyrus rolls, hidden in vases, or like in Egypt on limestone or adobe plates. From Israel we know the custom to roll the scroll around a rod and seal it in a copper cylinder - and in fact in many of the objects remnants of plant material which could have been writing material was found. In connection with the place they were found - in pits under the foundation of the houses - the explanation as lucky charm for the house and its inhabitants seems most likely in my eyes. "If the Egyptians already knew batteries, then different generators will probably have been known" is a merry, but absurd or missing way of proving a theory. When Volta experimented with his batteries, he lived in the age of the research and progress. Each detail, each improvement was published and hundreds of scientists around the whole globe were busy with the study of nature and exchanged their results in innumerable publications. Nevertheless it lasted nearly 200 years until the electric induction was discovered, and out of this in the end the generator was developed. This needed an unbelievable number of small steps, and each of these can be reconstructed from uncounted publications. From the Parthic, Babylonic or Egyptian region however no evidence for a systematic study of physics or chemistry, which is a mandatory prerequisite for the development of such technique is known. But without this knowledge no genius amateur handicraftsman can "by coincidence" invent something like a generator. This conclusion is therefore just as soundly as the reason chain "They had wheels, therefore they knew a combustion engine". Well, that was the next basis for the lamp theory which has been gone down the drain. With the only known possible energy source no lamp could have been used in every-day use as the authors have proposed, and so they could not have been used as light source for tombs and pyramids. So we are back to oil lamps here, and another part of evidence for the necessity of this advanced technique has gone down the drain, too. What's left is another "cult" explanation some alternative authors have in reserve: The Pharaoh, demonstrating that he is a true son of the sun by illuminating a light bulb during certain ceremonies. Hm, funny, if I remember correctly all those disciples of ancient astronauts and lost civilizations are constantly raging about archaeologists declaring this and that as cult - but now we are down to a lamp cult proposed by the alternatives themselves.